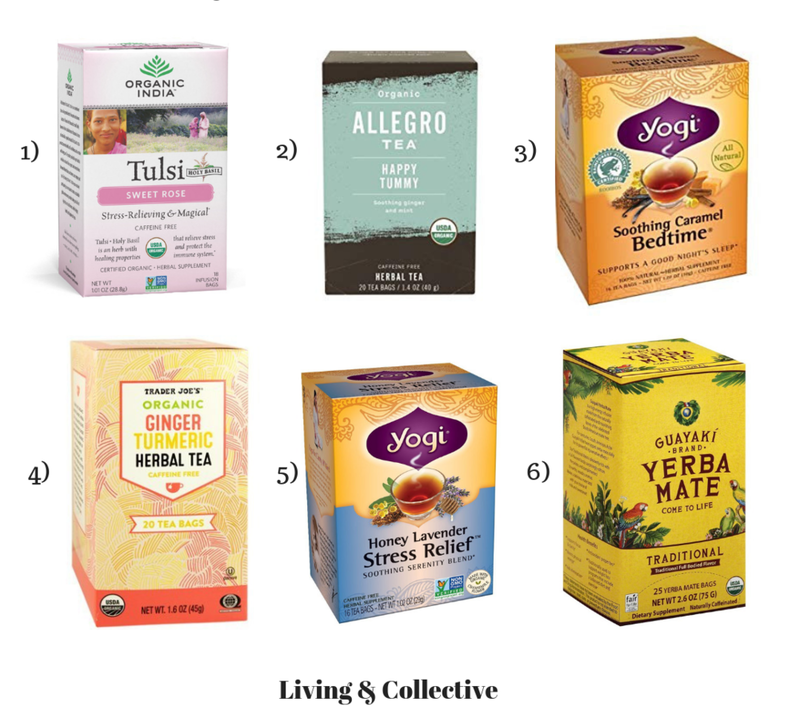 We are so excited to share some of favorite teas - each with its own unique qualities & purpose. Replacing your other drinks (perhaps that evening cocktail!) with tea will help boost your immune system & help you feel & sleep great. Enjoy!!! 1) Organic India Tulsi Sweet Rose - Rose and Chamomile make up this delicious tea and it contains holy basil which is stress-reducing & helps keep you calm. It also has adaptogens which counteract stress in your body! This tea is caffeine free. Buy here. 2) Allegro Happy Tummy - Soothing ginger & mint make this tea great for soothing your stomach & aiding & balancing a healthy digestive system. This tea is caffeine free. Available at Whole Foods Market or here. 3) Yogi Soothing Caramel Bedtime - This is a naturally sweet Roobios tea that supports sleep by helping calm the body & mind. Think vanilla & caramel - yum! This tea is caffeine free. Available at Whole Foods Market, Randalls, or Walmart. 4) Trader Joe’s Organic Ginger Turmeric - This is a very soothing, mild tea that has natural anti-inflammatory properties. It has ginger, turmeric, licorice root & orange peel. This tea is caffeine free. Available at Trader Joe’s or online here. 5) Yogi Honey Lavender Stress Relief - Made with all the herbs for relaxation - lavender, chamomile, and Lemon Balm. This is a great tea to help you unwind. It is naturally caffeine free. Available at Whole Foods Market, Randalls, or Walmart. 6) Guayaki Yerba Mate - Need an energy boost or want to replace your coffee? This is your best choice! It is filled with antioxidants & is sure to give you that healthy energy you are looking for. This tea does contain caffeine. Buy online here.